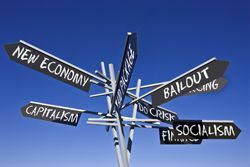 The economic models and theories that prevailed through the 20th century are rapidly falling apart. Economists scramble to offer explanations and solutions. However, much of what has gone wrong was anticipated years ago by E. F. Schumacher, who proposed a theory of "Buddhist Economics." Schumacher was among the first to argue that economic production was too wasteful of the environment and non-renewable resources. But even more than that, he saw decades ago that ever-increasing production and consumption -- the foundation of the modern economy -- is unsustainable. He criticized policy makers who measure success by the growth of GNP, irrespective of how the growth comes about or who it benefits. Ernst Friedrich "Fritz" Schumacher (1911-1977) studied economics at Oxford and Columbia University and for a time was a protégé of John Maynard Keynes. For several years he was the Chief Economic Adviser to Britain's National Coal Board. He also was an editorialist and writer for the Times of London. In the early 1950s, Schumacher became interested in Asian philosophies. He was influenced by Mohandas Gandhi and G.I. Gurdjieff, and also by his friend, the Buddhist writer Edward Conze. In 1955 Schumacher went to Burma to work as an economic consultant. While he was there, he spent weekends in a Buddhist monastery learning to meditate. The meditation, he said, gave him more mental clarity than he had ever had before. The ideal is sufficiency, not surfeit. "Economic 'progress' is good only to the point of sufficiency, beyond that, it is evil, destructive, uneconomic." A Buddhist economy distinguishes between renewable and non-renewable resources. A civilization built on renewable resources is superior to one built on non-renewable resources. The second principle might not seem original now, but in 1955 it was economic heresy. I suspect the first principle is still economic heresy. "Standing Truth on Its Head"
After his return to Britain, Schumacher continued to study, think, write, and lecture. In 1966 he wrote an essay in which he laid out the principles of Buddhist economics in more detail. Very briefly, Schumacher wrote that western economics measures "standard of living" by "consumption" and assumes a person who consumes more is better off than one who consumes less. He also discusses the fact that employers consider their workers to be "cost" to be reduced as much as possible, and that modern manufacturing uses production processes that require little skill. And he pointed to discussions among economic theories about whether full employment "pays," or whether some amount of unemployment might be better "for the economy." "From a Buddhist point of view," Schumacher wrote, "this is standing the truth on its head by considering goods as more important than people and consumption as more important than creative activity. It means shifting the emphasis from the worker to the product of work, that is, from the human to the subhuman, a surrender to the forces of evil." In short, Schumacher argued that an economy should exist to serve the needs of people. But in a "materialist" economy, people exist to serve the economy. He also wrote that labor should be about more than production. Work has psychological and spiritual value also (see "Right Livelihood"), and these should be respected. In 1973, "Buddhist Economics" and other essays were published together in a book called Small Is Beautiful: Economics As If People Mattered. Schumacher promoted the idea of "enoughness," or providing what is sufficient. Instead of ever-increasing consumption, the emphasis should be on meeting human needs with no more consumption than is necessary, he argued. From a Buddhist perspective, there is a great deal more that could be said about an economic system that sustains itself by stoking desire and reinforcing the notion that acquiring things will make us happier. We end up with no end of entertaining consumer products that soon end up in landfills, but we fail to provide for some basic human needs, like health care for everyone. Economists scoffed when Small Is Beautiful was published. But although Schumacher made some errors and miscalculations, on the whole, his ideas have stood up very well. These days they look downright prophetic.